I received an Advance Copy of this book and reviewed in on March 18! The book will hit stores tomorrow! Thanks to the author I have 3 copies to give away! I love mysteries, but add in the food… oh YEAH! I love the cover of this book!! Cozy mysteries are one of my favorite genre and this sounds like a winner. Thanks once again for the great giveaway!! This book is definitely on my list! After reading the review I want to read the book, it sounds great. Food and mystery, what could be better? I love the cover! Thanks for the chance to win. Sounds absolutely mysterious and amazing. I do love comfort food…cozies and comfort food go together quite nicely I reckon. I love cozy mysteries. Thank you for the giveaway. Happy the snow is finally almost all gone in my part of WI. cute cover.looks like it will be good. It sounds good. Love the pretty cover. Thanks for having the giveaway. The cover is beautiful. 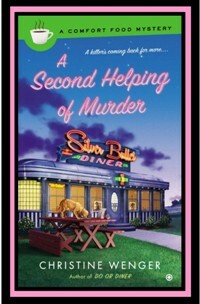 Do or Diner is on my TBR list and now so is a Second Helping of Murder. Love to try out new authors. Add food and you’ve got a winner I hope! !